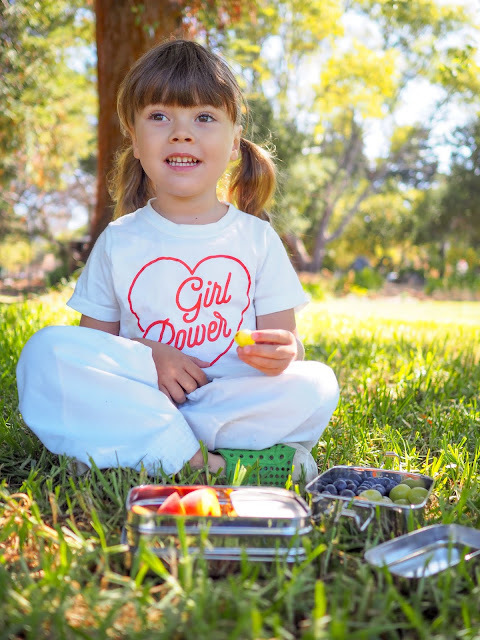 Now that the kids are back at school, after school snacks have become a big thing in our home again. 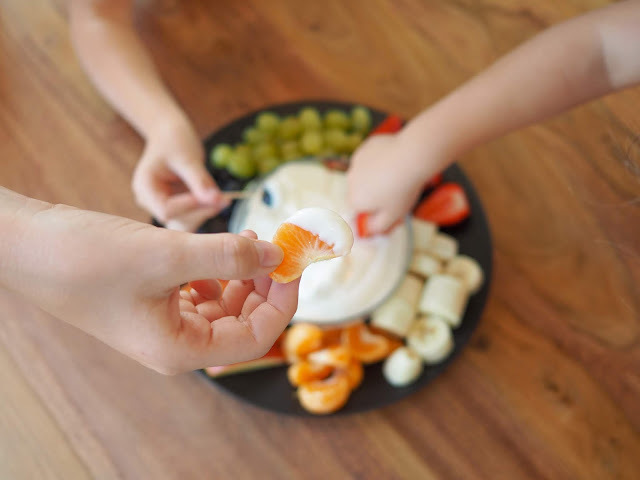 It can be so tempting to grab a pack of chips or a cookie, but I like to make sure that my kids eat something healthy after school. Of course, healthy doesn't have to mean boring! 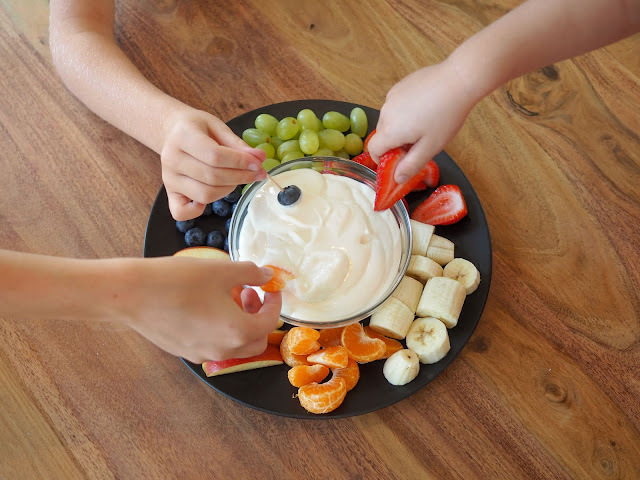 My kids already eat a lot of fruit after school and they don't need much tempting to choose an apple or strawberries as their snack option, but sometimes it's nice to make it a little more fun for them, while still keeping it healthy. Fun, tasty and healthy! 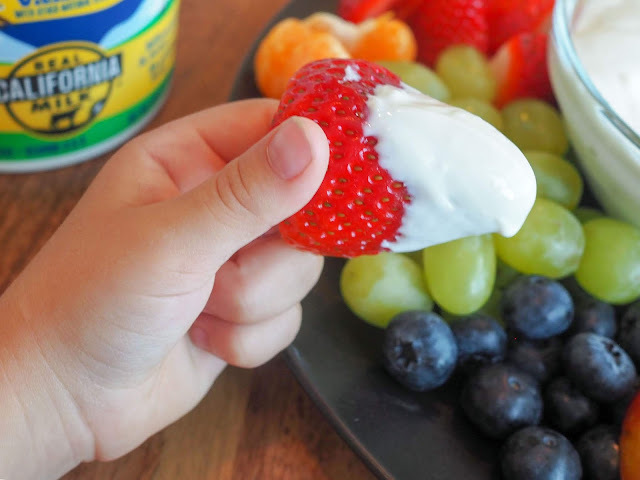 Today on the blog I'm sharing a simple recipe for a sweet creamy dip to make snacking on fruit just a little more tasty. It's also a great source of protein which gives kids the energy they need. It's great for after school snacks at home but can easily be taken to after school activities or even in a lunch box for a lunch time treat. It would even make a great party dish! Best of all? It's super easy to make and only require three ingredients! The kids can even help. 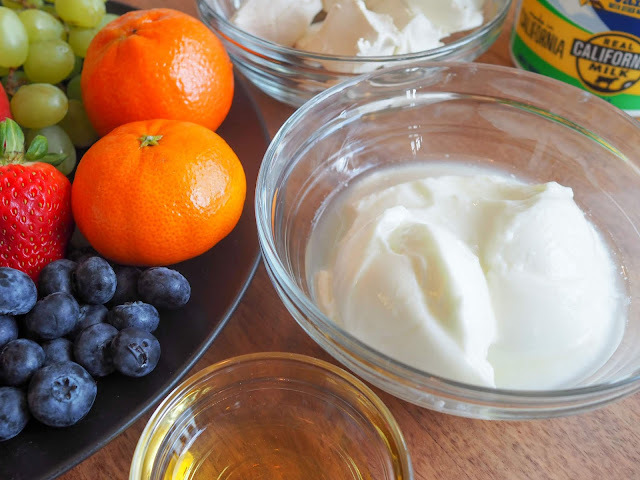 Place the cream cheese in a large bowl and mix until smooth. Add the yogurt and mix together until smooth. Add the agave syrup and mix together. Give it a taste and if it's not quite sweet enough for your liking add a little more agave syrup. 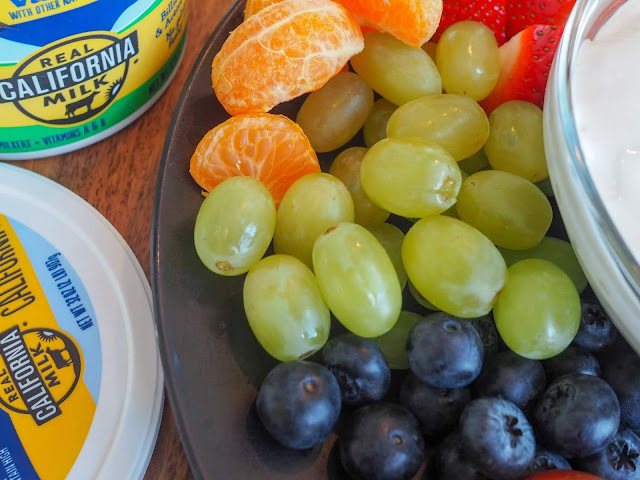 Place the dip in the fridge to chill while you prepare the fruit. Cut the fruit to your liking and place on a large platter with a small bowl in the center. Add the creamy dip to the bowl and voila, it's ready to eat! My kids like to use their fingers to hold apple slices, mandarin pieces and strawberries, but for smaller fruit like grapes and blueberries (or squishy fruit like banana) they like to use a toothpick. For on the go snacks, I like to place the fruit into a bento box with a small dip container, but any container will do. This recipe makes such a great snack to take along to after school activities or picnics and is great for sharing with friends. 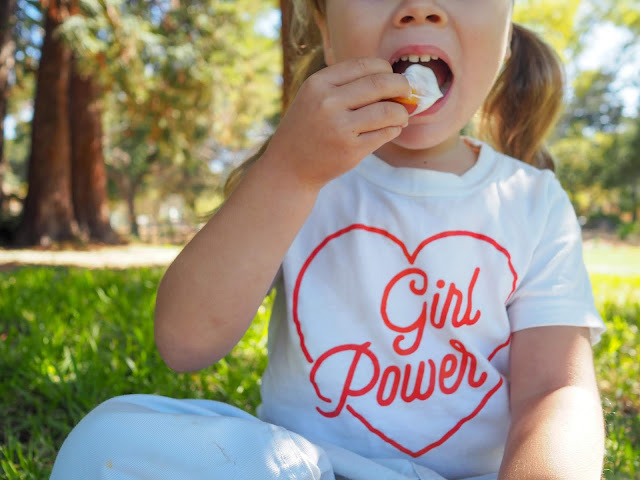 Mathilde took this along to karate class in the park this week and the sweet creamy dip was a hit with all her friends - although she was pretty keen to eat it all herself! I love that this simple recipe combines two of my kids' favorite (and my favorite!) food groups - dairy and fruit. We eat a lot of both in our home, not only because they taste good, but because they're great for fueling active bodies. 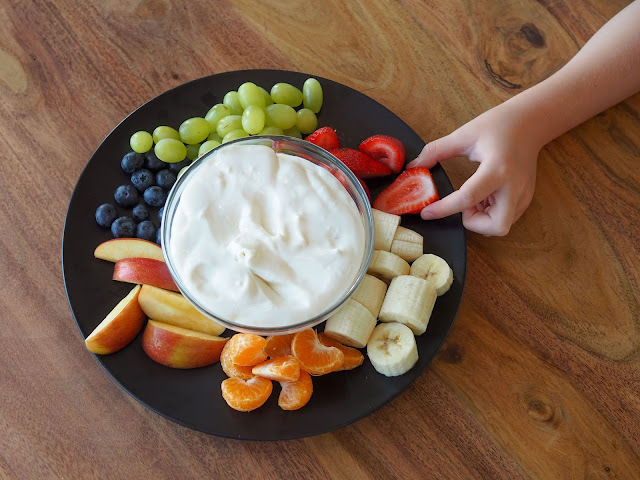 My kids are so busy with school followed by swim team or karate class every day that they need the vitamins, minerals and protein that dairy provides. Of course, it doesn't hurt when it tastes this good! When it comes to dairy products, I like to make sure I'm buying products that are produced with local Californian milk. I love knowing that not only am I helping to support local dairy farmers, but my purchase is helping local communities. To make sure I'm buying products made with local milk I keep an eye out for the Real California Milk seal. To find out more about Real California Milk and to find your local stockist click here.